The silhouetted structure seen through the mist immediately behind the woman in this print in the Lyon Collection is the Komagata-dō (駒形堂), a temple dedicated to Batō-Kannon, the horse-headed manifestation of the goddess of mercy. This is not surprising considering that 'Komagata-dō' means 'pony-shaped hall'. Komagata can be found along the Sumida River in the Asakusa section of the city. In Edo Culture: Daily Life and Diversions in Urban Japan, 1600-1868 by Nishiyama (p. 167) its importance in the history of Edo cuisine is made clear: "Shops specializing in cuisine first appeared in Edo, but they did not develop rapidly. For the gourmet, both chōnin and warrior, the center of social life continued to be the licensed quarters at Yoshiwara. Until the Horeki period (1751-1764) one hears nothing of Edo restaurants other than the plebeian ones serving "Nara tea." During the tranquil Tanuma period (1767-1786), however, two teahouses suddenly changed the world of Edo cuisine. One of these houses, the "Surugaya," was located at Asakusa Komagata-chō..."
Numerous artists used Komagata as a focal point of their imagery. 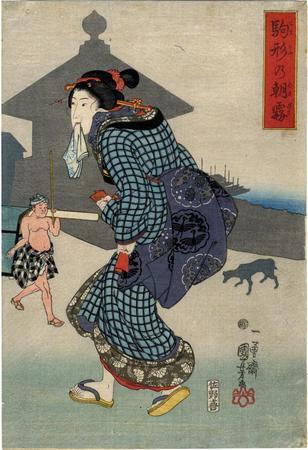 They often used the Komagata-dō - the building immediately behind the woman in this Kuniyoshi print - as the main theme, but not always. Some of these artists were Masanobu, Harunobu, Kiyonaga, Hokusai, Eisen, Hiroshige, Hirokage and even in the 20th century Hasui. Komagata-chō was a long narrow section of Edo running between the Sumida River and the beginning of the Ōshu Kaidō, the highway leading to the north of Japan... It is not far from Asakusa, there were many restaurants there, and there was a ferry, the Komagata no watashi (also known as the Take-no-chō no watashi). Even after the construction in 1775 of a bridge nearby, the Azumabashi, this ferry continued to operate, down to 1876... and it was known for short as Komagata... Harunobu's print no doubt shows the landing used by the ferry. Komagata was also the site of an illegal pleasure quarter, which is described in several sources... but probably came into existence only after 1784, when Komagata was one of the karitaku used after another fire in the Yoshiwara. A karitaku (仮宅) is a temporary lodging. 1) In color in 歌川国芳展: 生誕200年記念 Utagawa Kuniyoshi: Exhibition to Commemorate the 200th Anniversary of his birth, 1996, #159, p. 126. In color in in Kuniyoshi by Jūzō Suzuki, Heibonsha Limited, Publishers, 1992, no. 262. The entire triptych is shown here and is referred to as 'Morning Haze over Komakata'.